The Philadelphia PowerPlay have participated in seven tournaments: four U.S. Championships, comprised of powerhockey teams in the United States, and three Powerhockey Cups, made up of powerhockey teams in both the US and Canada. The U.S. Championships take place on every odd-numbered year while the Powerhockey Cups are played on every even-numbered year. The PowerPlay participated in their first tournament in 2009 at the Carolina PowerHockey Invitational in Raleigh, North Carolina. The tournament consisted of the Michigan Mustangs, Minnesota Selects, and the hosting team, Carolina Fury. After not competing in the 2010 Powerhockey Cup in Toronto, the following year, the PowerPlay hosted their first tournament, the 2011 U.S. Championship in Aston, PA. The PowerPlay finished in third place after defeated Carolina Fury in the bronze medal game. Jake Saxton’s overtime game-winning goal. In 2012, the PowerPlay traveled north of the border to play in their first international tournament, the Powerhockey Cup in Ottawa, Canada. As the youngest team in the tournament, the PowerPlay turned some heads with their fight and spirit but ultimately finished in sixth place out of eight teams. In 2013, the PowerPlay hosted their second tournament, the U.S. Championship in Aston, PA. They defeated the Michigan Mustangs 9-4 in the finals to capture their first United States Powerhockey championship. The PowerPlay arrived in St. Paul, Minnesota for the 2014 Powerhockey Cup. They advanced to the finals after a dramatic comeback against the Calgary Selects in which forward Jake Saxton scored the game-winning goal in overtime. The undefeated PowerPlay faced off against another undefeated team, the Minnesota Saints. Despite another comeback effort, the PowerPlay fell short and lost 5-4. For more information on the 2014 Powerhockey Cup, visit www.powerhockeycup.com/2014/. The 2015 U.S. Championship was hosted by the Michigan Mustangs in Plymouth, Michigan on July 16-18. Four teams, Minnesota Saints, Michigan Mustangs, Philadelphia PowerPlay, and Texas Motor Mavs competed for the championship. After finishing the round robin with a 2-1 record, the PowerPlay fell to Michigan 5-2 in the semifinals. The PowerPlay defeated Texas 5-4 in the bronze medal game for third place and finished with an overall record of 3-2. On July 8-11 of 2016, the PowerPlay hosted the Powerhockey Cup at the Pennsylvania Convention Center in Philadelphia, PA. The tournament was made up of six teams: Michigan Mustangs, Minnesota Saints, Ottawa Capitals, Toronto Lake Raiders, Toronto Rock, and the PowerPlay. The PowerPlay started off slow, finishing the round robin with a 2-3 record. Going into the elimination round as the #5 seed, the PowerPlay found their game. In the quarterfinals, goaltender Anthony Damico led the team to a shutout over the Ottawa Capitals 5-0. Against the Michigan Mustangs in the semifinals, forward Alex Pitts scored the game-winning goal with 29 seconds left in regulation to send the PowerPlay to the championship game. 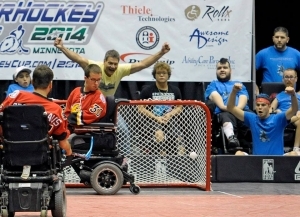 In a rematch of the 2014 Powerhockey Cup, the PowerPlay took on the Minnesota Saints. Similarly to 2014, the Saints jumped out to an early lead and after a scoring opportunity with seconds remaining, the PowerPlay lost 4-3. The Powerhockey Cup also featured two exhibition teams, the Philadelphia PowerPlay Grays, made up of players from the Philadelphia PowerPlay wheelchair hockey league, and the North American Selects, made up of players from all other teams participating in the 2016 Powerhockey Cup. These teams played two exhibition games. For more information on the 2016 Powerhockey Cup, visit www.powerhockeycup.com/2016/. Patrick Hilferty passed away in May of 2017 from complications due to his Muscular Dystrophy. The team had established an on-going relationship with the Philadelphia Flyers of the NHL, and the Flyers adopted the team as the first power hockey team to be affiliated with an NHL team. This was done to honor Pat’s memory and to encourage other NHL teams to reach out to their respective disabled communities to spread the message and grow the sport of power hockey. Involved in the Philadelphia Flyers PowerPlay are people of all ages and all walks of life. We have students, teachers, parents, etc. Our players have a wide range of disabilities from Duchene Muscular Dystrophy, to Cerebral Palsy, to Traumatic Brain Injury and even a player who suffers paralysis from an IED. There is no age restriction, thus our current players range in age from 10–40! This provides mentorship opportunities for the older players with the younger ones and also provides awareness of other disabilities than the players own. The only restriction placed is that players must be able to safely navigate their wheelchairs while on the court. We encourage players with a wide range of physical challenges and ages to participate in the Philadelphia Flyers PowerPlay. This provides team comradery and mentoring relationships for both players and family members. The Philadelphia Flyers PowerPlay’s ultimate goal of the mission is to reach as many members of the power wheelchair community as possible and to shed light on the sport, our team, and its inclusive nature. Who are the Philadelphia Flyers PowerPlay? The Philadelphia Flyers PowerPlay, a 501 (c) (3) nonprofit organization, is a power wheelchair floor hockey team based in the Philadelphia Metropolitan Area. As of September 2017, we are an official affiliate of the Philadelphia Flyers. Power Hockey is essentially floor hockey for power wheelchair users. We follow the rules and regulations of the United States Electric Wheelchair Hockey Association (USEWHA). Visit our Powerhockey page for more information. View the North American Powerhockey Association Rule Book. Who can play for the Flyers PowerPlay? Our team is open to all competent power wheelchair users. Our team is made up of about 30 players with various disabilities including Muscular Dystrophy, Cerebral Palsy, and Spinal Chord Injuries. There is no age restriction and both male and female participants are welcome! Do the Flyers PowerPlay have a schedule? Yes. We play twice a month on every other Saturday. The season starts in September and ends in June. The full schedule with directions to the venues can be found on our schedule page. How can I join the Flyers PowerPlay? Those who are interested in joining the team are required to register on our registration page. There is a mandatory $50 registration fee to join the team each year. Registration is open year-round. There is no limit to the number of players on our team. We are always looking for new players to join! Can I come and watch a game before joining? If you would like to come to a game before joining the team, we encourage you to do so. In fact, anyone who wants to come to a game is more than welcome! You can meet our players, families, and see how we play and operate. We look forward to seeing you at our next game! Can I donate to the Flyers PowerPlay? Yes. Your donation can be mailed to our address 1201 Blythe Ave, Drexel Hill, PA 19026 or submitted via Paypal here. Our EIN number is 46-0849155.